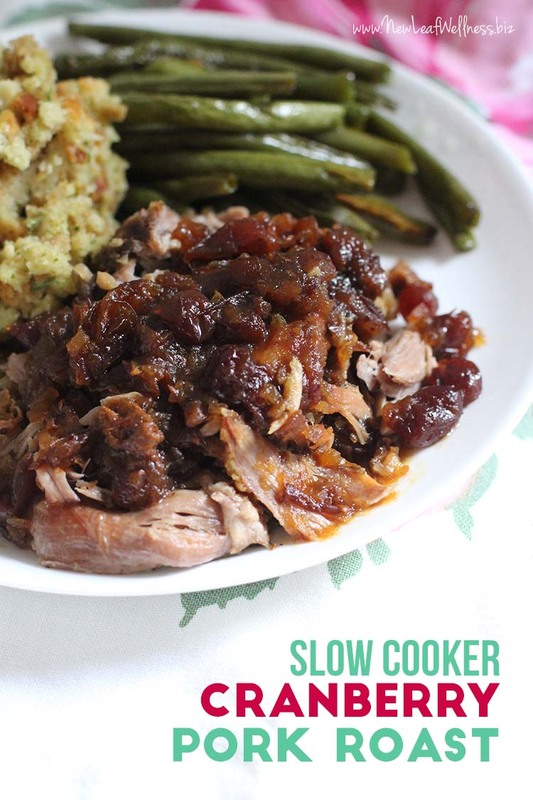 I made a dinner this week that was too easy and yummy not to share: Slow Cooker Cranberry Pork Roast. It only requires four ingredients and was a huge hit with my family. Yay! 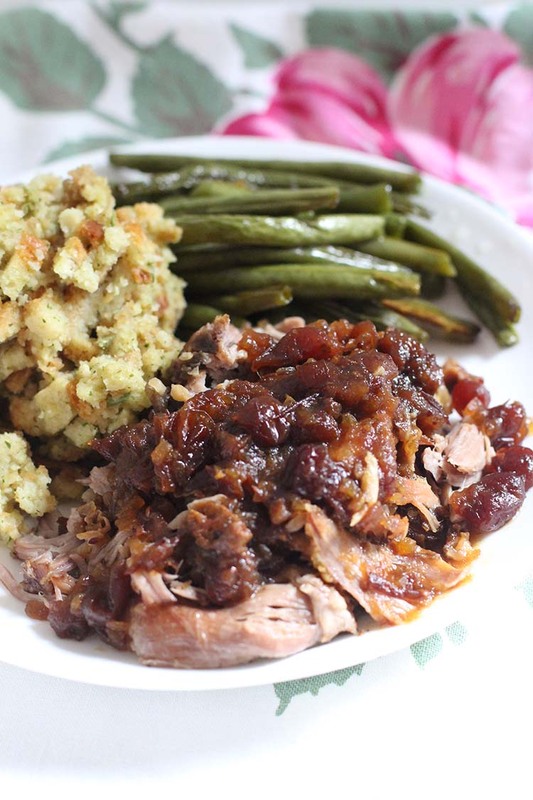 With only four ingredients, this slow cooker cranberry pork roast recipe is something that anyone can make. Simply combine the ingredients and let your slow cooker do all of the work for you. 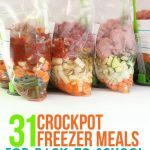 It only takes a few minutes to add the ingredients to your slow cooker in the morning, but you can also assemble the ingredients in a gallon-sized freezer bag and freeze for later. Next time pork roasts are on sale at the grocery store, you can buy a couple, freeze for later, and save lots of $$$. Cook fresh or freeze to cook later. I recommend serving the leftover cranberry mixture in the slow cooker with the meat – it’s so yummy! Add some sides of green beans and stuffing and dinner is done. Combine all ingredients in your slow cooker and cook on “low” setting for 6-8 hours or until pork shreds easily with a fork. Remove bones and shred meat. 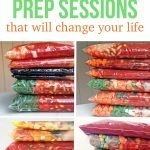 Combine all ingredients in a gallon-sized plastic freezer bag and freeze for up to three months. When ready to eat, thaw overnight in refrigerator. Add to slow cooker and cook on “low” setting for 6-8 hours or until pork shreds easily with a fork. Remove bones and shred meat. 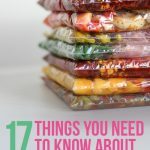 You can find more easy freezer recipes, tips, and nutritional info in my best-selling freezer eCookbooks. Thoughts or questions? Leave a comment below and I’ll respond as soon as I can. I’d love to hear from you. We are getting ready to have this for dinner tonight! I did a pork tenderloin instead of a roast. Smells amazing in my house right now!! What do you use for your liquid? Broth or water? so what liquid would you use? You dont need liquid with a crocker, it comes from the meat juices. Can I use beef roast instead of pork? Yes. My favorite cut of beef is boneless beef chuck shoulder roasts. I’m newer to cooking different cuts of meats….I have Country Style Ribs in the fridge….is that something that would work? I think the sauce would work (you could even bake for 10-15 minutes on a foil-lined pan at the end to thicken it up), but I’m not 100% sure about that cut of meat. I’ve never bought it before and I’m worried it could be fatty or chewy. So glad I saw this. I’m using a tenderloin too and was wondering if it would work as well. Thank you! Is the 10-12 hours on low for if you are starting with the meat frozen? Should I adjust the time if I did not freeze it? The 10-12 hours is for raw meat. I use a 4-quart slow cooker and it needs to cook that long to easily shred with a fork. If you use a bigger, stronger slow cooker, the cooking time might be closer to 8-10 hours. And if the meal starts frozen, I would add an hour or so to the cooking time. I would cook it 6 hours in my 6 quart slow cooker and 8-10 in my 4-quart. No, I’m sorry! I’ve never calculated it before. A serving size of pork is supposed to be 3 oz. This recipe calls for 2.5 lbs of pork so this recipe should be over 13 servings. 2.5 pounds is the uncooked weight and includes the bones. There is no way this size of meat would feed 13 people. Cook’n software will calculate the recipe specs for you. DVO.com to buy. Just saw your site and am looking forward to looking at your other recipes. How many would you say this will serve, am I missing that somewhere? I am having five adults for dinner. It will depend on the exact weight of the meat you buy, whether it contains a bone or not, and the size of each adult’s appetite. If I was going to make this recipe for 5 adults, I’d buy the biggest bone-in pork shoulder that I could find at the grocery store, something like 3 pounds. I don’t think 5 adults will fit into a slow cooker. What if it’s a big slow cooker and the adults are really small? I just use 2 things: 1 Can of cranberries and Onion soup mix! I wonder how fresh cranberries would taste? Fresh cranberries are very tart so you would definite need something to sweeten the dish!